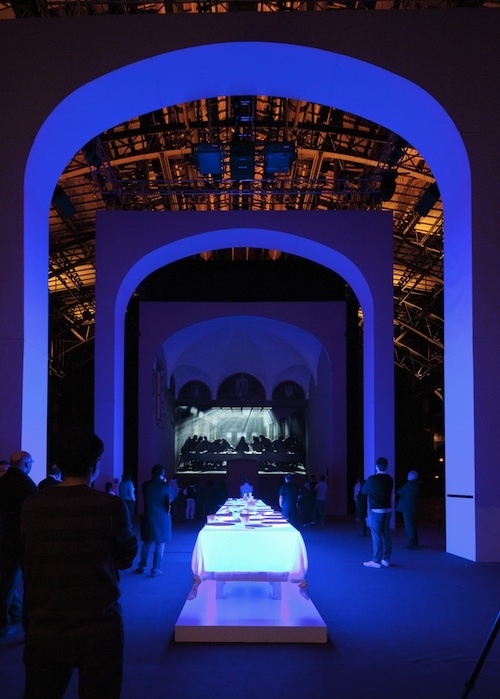 Peter Greenaway's sound and light dramatization of Leonardo da Vinci's 1492 painting The Last Supper makes for a breathtaking installation within the monumental walls of the Park Avenue Armory in New York. Greenaway's films, (The Cook, The Thief, His Wife & Her Lover, The Pillow Book among others) have often encouraged dialogue between cinema and painting -- with nearly two millennia of Western painting and only a century of cinema, Greenway often seeks to blend the vocabularies of the two traditions, "To use painting to fix and stabilize and limit and frame the image," explains Greenaway, "...and to use cinema to make a painting move and change, have a temporal life and have a sound-track." 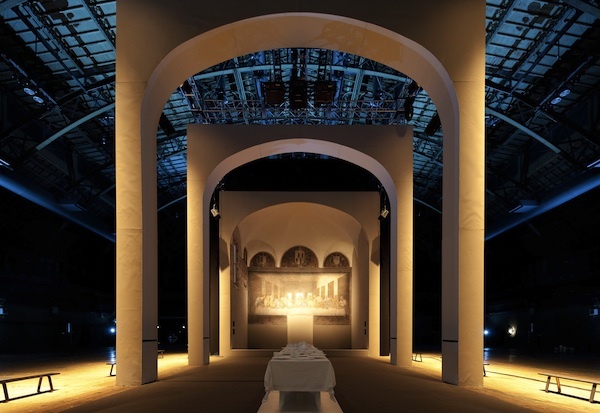 Installation view of "Leonardo's Last Supper: A Vision By Peter Greenaway" at Park Avenue Armory, on view from December 3, 2010, through January 6, 2011. Photo by Colin Miller. 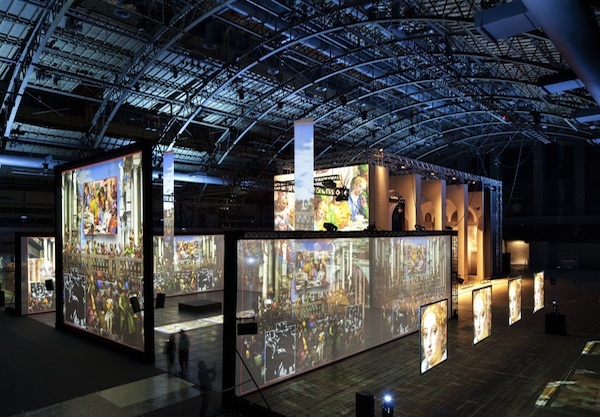 Image Courtesy of Park Avenue Armory. 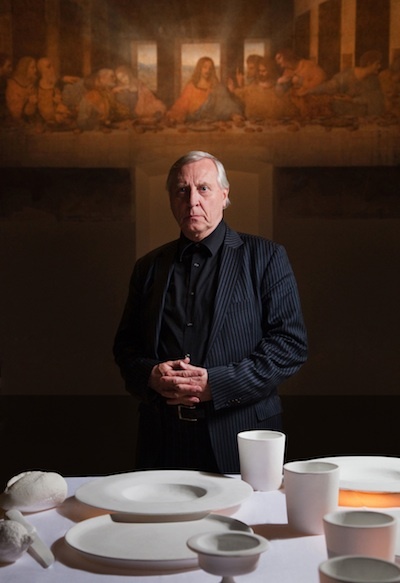 The Last Supper is not his first installation, and Greenaway has worked on Rembrandt's 1642 Nightwatch, and Veronese's 1563, Wedding at Cana- with future plans of tackling Velasquez's Las Meninas; nor are his 'collaborations' limited to masters of the renaissance as he also hopes to work on Picasso's 1937 Guernica. 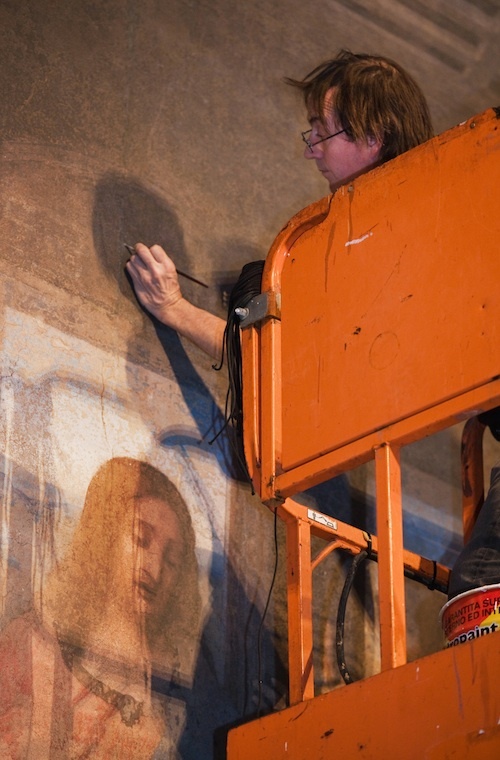 To build the installation at the Armory, the painting was 'cloned' from the walls of the refectory of Santa Maria delle Grazie in Milan, where it is on show with restricted viewing because of its fragile condition. A high-resolution scan was made to record the photographic data at 800 dpi and then, after colour-matching, the work was printed on a replica of the original surface. Greenaway then altered the digitized data to animate the painting in incredible detail, adding to the painting's light sources to create shadow and depth. Da Vinci's Last Supper -- in which Christ is depicted dining with his disciples at the exact moment just prior to the knowledge of his betrayal -- sets up an interesting dynamic of 'guess-who' mystery at the dinner table. The lighting adds elements of deceit and drama to the theatrical cast of characters. Greenaway plays with the purported puzzles woven into the painting, the enigmatic constellation of objects which conspire and hint at diagrams of the night sky, and then he embellishes on the subtext and metaphors in the hand gestures of the dinner guests to create the illusion of a living painting through the rhythm of the accompanying music. The weight and symmetry of the composition, and Leonardo's use of two light sources, coincides with Greenaway's formalist approach to film-making with his emphasis on framing and lighting to animate, examples of which can be seen as far back as in A Zed and Two Noughts and most recently in Rembrandt's Nightwatch. Greenaway makes the painting come alive, not just with light but emotionally for the casual or even irreligious spectator, and considering the gaze of the average art viewer maybe as little as 15 seconds, it is remarkable how long one is enthralled by the power of this installation - running at 45 minutes. The director's interest in architecture (for example in The Draughtsman's Contract) plays a role in the layering and building of the installation to create a riveting architectural cinematic experience. Greenaway says, "Italian paintings are full of architecture." Painters from Raphael to Veronese were inspired by architecture. Though at some point after Leonardo's era, painting overtook the influence and power of architecture, growing beyond just decorative value to dominate past it, But within the island cities of Italy, Greenaway continues, "What these painters saw and experienced and lived in became developed and fantasized, reworked and refashioned, extended and improved, Architecture sheltered paintings of architecture."